The European Restaurant "the bistro" at Novotel Ambassador Gangnam presents special summer "Ginseng Dish Promotion." Ginseng has been one of the most beloved dishes in summer as it helps circulate blood and recover from fatigue. 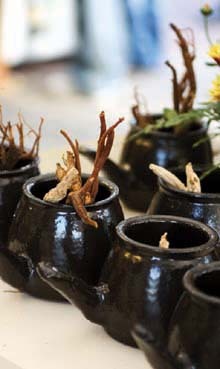 During the promotion, guests can enjoy a fine display of Ginseng soup, appetizers, main dish and dessert buffet with a glass of Ginseng wine. Featured dishes include "Cold leek soup with ginseng & sesame leaf and Ginseng tofu" and "Light cream of chicken, Yuzu lemon zest and ginseng Royal." For appetizers, it has various choices including "Tower of Prawn dressed with a Ginseng cocktail sauce" and "Mixed Vegetable terrine, Tomato Ginseng dressing." There are also 7 main dishes to choose from including "Mero & Pomfret filet in papilotte with ginseng & Terryaki sauce," "Poached chicken breast, Ginseng & Saffron broth and couscous' and more. A glass of fine Ginseng wine will be served along with the main dish followed by dessert buffet featuring "Savarin soaked in ginseng liquor," "Fresh Fruit Gobbler or Crumble," "Almond jelly in Orange sauce" and a lot more. "Ginseng Dish Promotion" at the bistro is available through September 11 at the price of 40,000 won.